This is the second post in a series. I started the experiment with the first post The Topsy Turvy Garden Experiment. This is just a quick update on our progress with the Topsy Turvy. We've been watering it every day as its been pretty warm lately. The tomato plant is starting to bear one decent size tomato already. You can see the tomato in the picture to the left. The tomato is about 1.5" in diameter already. That picture is actually from a day ago. 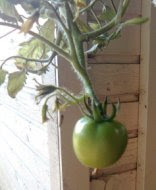 I looked at the plant again and I think theres another small tomato starting. My wife waters the plant when she lets the dog out. She spends about 10 seconds a day to water it. So over a week she has spent an additional 1-2 minutes of time. I thought about seeing if Home Depot had automatic watering equipment but the cost wouldn't be worth it for a single plant. Course theres no real reason to get automatic equipment cause my wife is not having a problem remembering to water it. It was just an idle thought that crossed my mind. I will do future updates when anything notable happens rather than writing to tell you every week that we're still watering it.